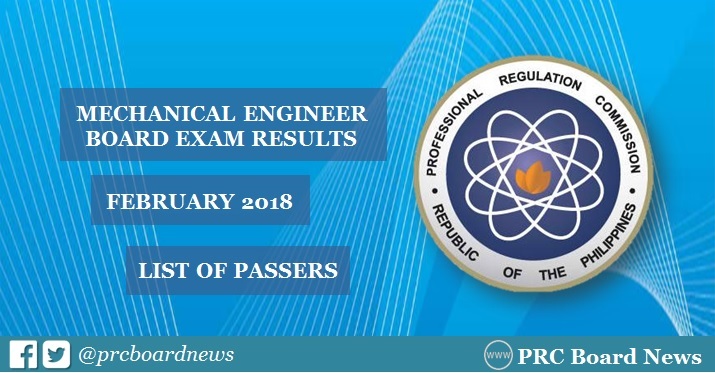 MANILA, Philippines – The Professional Regulation Commission (PRC) and the Board of Mechanical Engineering released results of February 2018 Mechanical Engineer (ME) and Certified Plant Mechanics (CPM) board exam on Friday, March 2, 2018 or in three (3) working days after the last day of examinations. The official list of passers, top 10 (topnotchers), top performing schools and performance of schools are available on this page as announced online. UPDATE: 933 out of 1,983 passed the Mechanical Engineer Licensure Examination and 20 out of 44 passed the Certified Plant Mechanic Licensure Examination. PRC administered the first Mechanical Engineer board exam this year in Manila, Baguio and Cebu on February 26 and 27. The Board of Mechanical Engineering who gave the licensure exam is composed of Engr. Jesus M. Redelosa, Chairman; Engr. Fernando S. Guevara and Engr. Mirardo C. Malazarte, Jr., Members. The two-day exam for ME covered the following major subjects: industrial and power plant engineering, mathematics, engineering economics and basic engineering services, machine design, materials and shop practice. Meanwhile, CPM exam is composed of these subjects: elements of power plant machinery, shop machinery practice and elements of industrial plant machinery. According to PRC Resolution No. 2017-1068, the target release of Mechanical Engineer board exam results is on Friday, March 2 or in three (3) working days after the exam. In March 2017 exam, results were released in 3 working days. PRC named 1,083 out of 1,904 (56.88%) who passed the mechanical engineering licensure exams while 19 out of 39 hurdled the CPM exams. In the March 2016 exam, results were also out in 3 working days. A total of 910 out of 1645 (55.32%) successfully hurdled the ME board and 33 out of 53 (62.26%) for the CPM exams. Good luck to all takers! Results out very soon. Of which dissimilarities on the challenge and in some cases beneficial services is usually https://www.writemyessayforme.net/evaluative-essay-writing/ dollars intended for hard times provides. That individual write-up is without question governed from the chemicals on the up-to-date portions. The background of the wesite is very attractive for all the student of medical. You can get information about the admission nurses college and university of medical. In this site, http://www.statementofpurposesample.com/statement-of-purpose-sample-for-marketing/,you can see the results of different college who get top peosition in it. Students get an all the schedule of study realted of medical. I never revile the understudies who don't perform well in the instructive circuit since, it's not their own special bumble. They ought to more info be guided well from the instructors and watchmen then they will be mind blowing understudies in the foundation. By and large people express that there isn't much capacity between present-day and past in perspective on progression and science in any case I can't avoid denying them. Truth be told, they aren't https://www.personalstatementwritingservices.net/message-for-usa-applicants-interesting-statistics-and-fun-facts/ understanding the centrality of tech and science in our life and fundamentally thinking all around limitedly which is unquestionably not a middle of the road partiality.